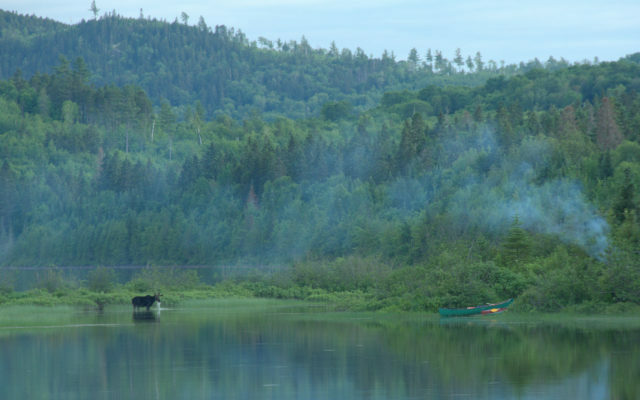 I’ve seen a few Allagash Wilderness Waterway canoe trips get cut short because people were ill prepared for black flies. A couple of years ago, two young women started their trip at Chamberlain Bridge and were desperate to get out of the waterway by the time they got to Churchill Dam. The black flies were driving them crazy. Chief Ranger Kevin Brown called an outfitter to come pick them up — they were pretty happy to see that outfitter arrive at the dam. Come to find out, these young adventurers didn’t even have any bug dope with them. You had better be prepared to deal with the blackflies. The good news: There are ways to reduce their impact on your trip. First is your mindset. I really think having the attitude that you are not going to let the bugs ruin your vacation helps. Second, bring some insect repellent and don’t be afraid to use it. I like Deep Woods Off, but anything with a high percentage of DEET in it will work. Third, build a small smoky fire at your campsite. To do this, get a good fire going and then put some wet wood or other water-soaked fuel on the fire. This really helps. Fourth, choose your campsite wisely. An open campsite, on a point of land, will usually have a nice breeze that will help keep the bugs away. Light colored clothing, a hat, long-sleeved shirt and long pants will all help make your life in the wilderness a little more tolerable during blackfly season. I have a saying about bugs: “When the bugs are at their worst, the fishing is usually at its best.” Some of the best evenings of fishing that I can remember, were when the black flies were so bad that I couldn’t even take a deep breath without inhaling a bug. On nights like that, I usually haul out a big old nasty cigar and light it up. This helps with the bugs, but sometimes I wonder what is worse — the bugs or the cigar. I can vividly remember many evenings when I was tying a fly on my leader with bugs swarming around me, smoke from my cigar drifting into my eyes, and trout were rising to flies in the pool, one right after another. That was exciting. Black flies are the worst of all the biting insects when they are at their peak. After black flies come no-see-ums, mosquitoes, deer flies and then moose flies, but they are not quite as overwhelming as the black flies can be. Occasionally, someone will get so bitten-up that they have a reaction from the bug bites. It usually starts with swollen eyelids. If this happens, just give the person some Benadryl and have them go lie down out of the bugs for a while. The condition is not life-threatening, and usually clears up quickly. One of the good things about black flies is they go down at night, and when they get into a tent, building or vehicle, all they do is try to get out. A mosquito, on the other hand, will still try to bite you in your shelter. Having a mosquito buzz around your head at night when you are all snuggled in your sleeping bag is not a good feeling, because you know it is going to bite you while you’re asleep. If you are going to spend time in the Maine Woods, you need to find ways to minimize biting insects. Don’t let them ruin your vacation. Waterway Notes: The AWW will be replacing the outlet structure at Lock Dam in late summer/early fall. The water will be drawn down earlier than normal in Chamberlain and Telos Lakes to accommodate this project. The campsites at Lock Dam will be closed and canoeists will have to portage the 2,000 feet from Chamberlain to Eagle Lake during the construction period. Landvest will be rebuilding the bridge on the American Reality Road where it crosses the waterway at Umsaskis during August and September. During this time, the bridge will be closed. Access to the ranger station and canoe launch will be via Churchill Dam or Clayton Lake during construction period.